Tooth whitening used to be a slow, tedious, and often painful process. Advances in technology have made whitening simpler and less expensive. I’m not going to bore you with the science behind whitening, but am briefly going to go over the different ways you can have whiter teeth so we can figure out which system is right for you. The four systems are: (1) over the counter, (2) custom fitted whitening trays for at-home use, (3) in- office tooth whitening, and (4) a combination of trays and in- office whitening. The first type and least expensive system is an over the counter system. There are hundreds of over the counter systems on the market today that can be purchased almost anywhere you shop. They are a great entry level for people who want to try whitening the teeth but who are not sure if whitening is for them. Let’s go over the pros and cons of over the counter systems. The pros are (1) cost, and (2) no need for impressions. The cons of these systems are (1) slower whitening process, (2) they are not one size fits all, and (3) the expense becomes greater if you have several shades to whiten. My favorite over the counter system is Sheer White®. 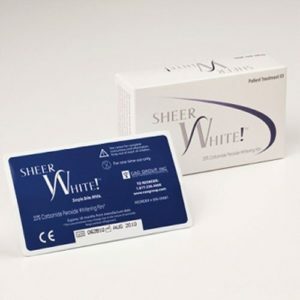 I recommend Sheer Whites because they fit much better than other over the counter systems I’ve seen, which gives quicker results with less complications. The fact that they can be bought on Amazon for around $25 allows people on the fence to get started at a reasonable cost. The downside is that customers have a buy a whole new kit every time one runs out. Everyone whitens at different speeds, but typically it would take 3 to 4 weeks whitening with over the counter products to get the result of one in-office whitening session. The second type and the best bang for your buck system is the custom fitted tray at-home whitening. With this system, we take impressions of your teeth, and we fabricate custom fitted trays that fit your teeth tightly. Since the trays are made for you, they hold the whitening gel in close proximity to your teeth which allows for faster whitening. It also allows us to control the concentration of whitening gel which we can customize to your schedule and needs. The trays for top and bottom are $199 to get started. Once you have purchased the trays, all you need going forward is to buy refill syringes of whitening material as needed. The fact that all you have to do is buy refill syringes will save you money in the long run over Sheer White strips and other over the counter systems. The pros of the custom trays are (1) they are the best value in the long run, (2) they are a very efficient way to whiten your teeth, (3) there is less gum irritation, and (4) it’s a flexible system to fit your schedule and needs. The only cons are (1) it is more of an initial cost than over the counter options and (2) it requires you to remember to wear the trays. We carry 2 concentrations of this whitening gel: a 15 minute option and an all night option, depending on which works better for your schedule. Here is a video showing how to wear the trays. The third option is an in-office option where we bleach your teeth for you at an appointment in our office. We use the Zoom tooth whitening system from Philips®. Zoom whitening also comes with the custom trays described above. It is great for people for need their teeth whitened quickly and for those that know they won’t remember to do it at home. After we do your in-office session, your teeth will continue to whiten for 3 days. The pros of this system are (1) speed and (2) the fact that you don’t have to do anything at home until it’s time for a touch-up. The con is it is more expensive than the other 2 options and that some patients have more sensitivity with this option than the other 3. Zoom whitening is $399 at our office. The final option is a system called Kor® whitening. This system isn’t just your regular tooth whitening system, and we usually reserve it for those with severe staining, especially those patients who have tetracycline staining from childhood. This type of staining is very difficult to whiten. It often has very strong horizontal lines in the center of the tooth that are very unaesthetic. Kor is the only system I’ve found that can get these patients to whiten well. Kor uses a combination of in office and tray whitening over the course of 6 weeks to 6 months. It also has a different prescription for people with different situations based off the color of your teeth and the reason for the discoloration. Check out some of their amazing results. 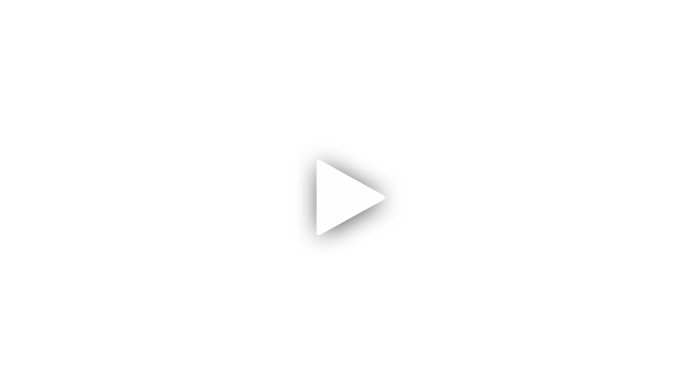 The Kor system varies in price depending which plan you need. The most expensive plan is $700. The major 2 things that make Kor special is (1) their custom fitted trays are made by a lab in their uniquely formulated manner which gives an amazing fit, and (2) they ship their whitening gel via refrigeration which keeps their whitening gel fresher and more powerful. Kor has a system for everyone but I usually reserve it for the most severe cases where the other plans won’t be effective. As you can see above, tooth whitening isn’t a one size fits all process. We are happy to discuss the above options more at your next appointment or via phone. I do want to touch on the downside of bleaching. None of the above systems will damage your teeth or gums at all long term, however during the whitening process and for up to a week after, you might have increased sensitivity to temperature, especially cold. Everyone becomes more sensitive but most patients don’t have much pain. I always tell patients that if you have no sensitivity to start with then it will very bearable. If you have sensitivity, we might not whiten your teeth every day, and it is probably best for you to not do Zoom since it uses a much higher concentration of bleach. 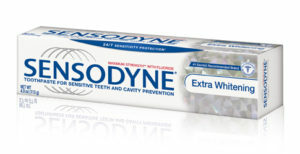 I recommend all patients to use a sensitivity toothpaste, like Sensodyne®, before and during the whitening process. It will always decrease the sensitivity and often make the whole process pain free. The only other problem people encounter with all the above system is ulcerations if the gel gets on your gums. This will heal in 3-7 days, and can be treated with Vitamin E. It is basically like a pizza burn, but it does happen sometimes if the gel seeps onto the gums. Luckily both problems resolve within 7 days of completion of the whitening process. There is only one group of people who shouldn’t whiten, and that is people who have dental work done in the front. The gel will only whiten natural tooth structure so any fillings or crowns will not whiten. Nothing makes me happier than seeing patients who have more confidence to smile after getting a whiter smile. With the many options and lower costs, what is holding you back? Feel free to reach out to us via email or phone.